Every August 6, I feel the same mix of sorrow and outrage. This year is even worse. At Hiroshima's Peace Memorial Park, the great people of Japan honors the victims of the 1945 atomic bombing. Meanwhile, the fascist clique that controls Japanese politics - and makes sure that the great people of Japan ignores the Imperial Japan atrocities that led to this bombing - continues its work of destruction on post-war Japan's peaceful ideals*. And this year, Japan is led by its most controversial Prime Minister since Abe's own grandfather, if not since Hideki Tojo himself: yes Nobusuke Kishi was an untried war criminal, but at least when he served as PM, he didn't act like his warmongering provocateur of a grandson. Even if Shinzo Abe doesn't eventually succeed in changing the constitution*, he'll try to change the interpretation of the text. That's one of the reasons why he put Shunji Yanai, a man who's been advocating such revisions for decades, at the head of the panel that will soon issue recommendations and guidelines for national security and defense**. Post-war Japan shall abandon its peaceful nature, lose its innocence to the same fascist breed that brought shame on the nation decades ago. Hiroshima is about the loss of innocence, the abominable cost of victory over abomination, the moral dilemma of using weapon of mass destructions to defeat war criminals, the dilemma of using nuclear power itself. 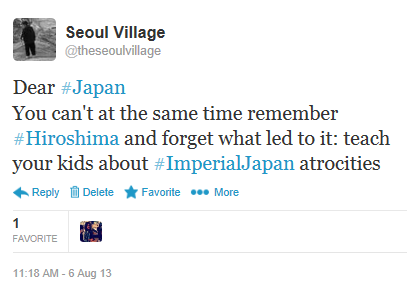 Hiroshima is certainly not about the innocence of Imperial Japan. And if a Tokyo court ruled (Ryuichi Shimoda et al. v. The State) that "the aerial bombardment with atomic bombs of the cities of Hiroshima and Nagasaki was an illegal act of hostilities according to the rules of international law", no Japanese court or government ever recognized any war crime by Imperial Japan, or any Japanese war criminal whatsoever. Just like the destruction of Dresden doesn't exculpate Hitler and the Nazis, Japan cannot at the same time remember the many innocent people who died in the Hiroshima bombing***, and erase from the nation's memory the atrocities of Imperial Japan at the source of this destruction. And Japan certainly cannot at the same time honor innocent victims in Hiroshima and war criminals in Yasukuni. Again, Japan cannot survive as a democracy if it doesn't confront its past and present enemies from within. And Japan will certainly not become a great nation by embracing Imperial Japan fascism again, but by denouncing and renouncing it for ever. ... and of course cleanse its political system from the worst enemies of democracy and peace. * see previous posts, and most recently for the Holocaust / Hiroshima parallel: "To better bridge the gap between Japan, Korea, and China, let's measure the gap within Japan"